Well, since I was able to buy my stuff on NeimanMarcus.com last night, I didn't feel like I need to get up early to go to Neiman or Target. It's raining here in San Francisco so I definitely did not feel like to wait in line in the rain either. 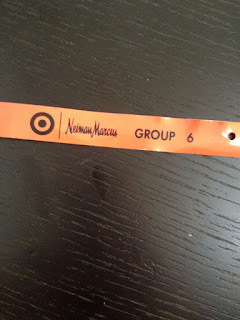 I got to Neiman at Union Square a little past 9AM. There were absolutely no line no mayhem no nothing. Just a door man there opening door which they usually don't have. 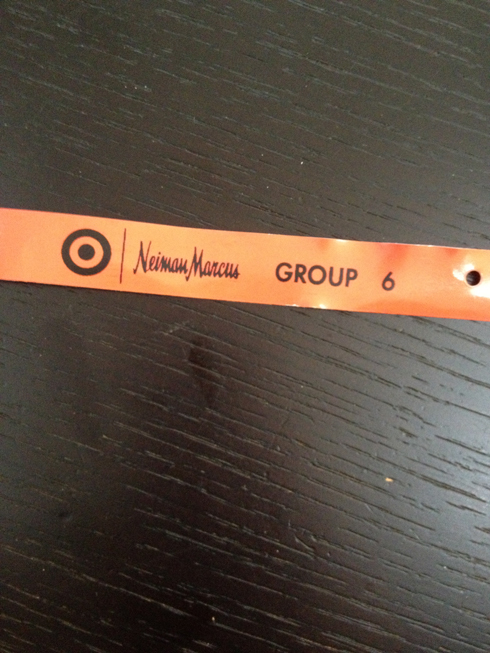 They put a wrist tag on me and told me I have 15 minutes to shop! I was like Puleeze, there is no one here. The collaboration area is on the 4th floor so you have to go up whole bunch escalators before you get there. They must have told every single employees to smile at you and be friendly because having shopped at Neiman for couple decades, I never have so many employees smiling at me! The rope off an area is on the fourth floor. The gripe I have about shopping at NM instead of at Target is that at Target you have a big cart where you can just throw stuff in. At NM, they give you a large plastic bag and you have to lug it yourself. Things get heavy quickly and I just didn't want to buy much because I did not want to lug them back to my car in the rain. To their credit, one of the sales came up to me and told me if I want to buy a lot, they can take my stuff downstairs to the sidewalk while I retrieve my car. Talk about customer service! You sure won't get that at Target. I declined because I feel it was a bit too much considering I'm buying bunch China made stuff that I don't need! LOL. But then again, I don't remember the last time I bought something at NM that I need anyway. There were definitely disappointments for me as well. Tory Burch stuff just looks like low end China made crap. Without the Tory Burch logo, it would sell for $5 at best. Jason Wu's little girl dresses look so bad next to Marchesa's. Jason's stuff look dull and uninspiring. I really thought they would look better than they did. Philip Crangi's picture frame and accent box were both blah. The finishes didn't look expensive at all. They should have used Borgo's manufacturer. These two products definitely do not look like they were expensive. I feel you can see similar things at a Ross outlet or something. I guess I won't be writing much about high low collaboration for awhile. The next one is Prabal Gurung for Target. Since there is nothing for me, I'm not likely to seek it out. I do wonder what's the next big collaboration after Prabal? An update. Everything in this collection is NOW 50% off online. I believe they will also be 50% off in store as well. Have fun shopping. Lots of really good deals at this price point!! !